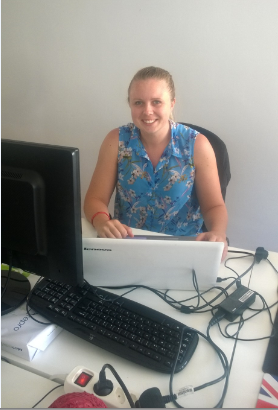 This week, we are glad to be sharing our offices with Suzy Kerton, the Clear Books financial director in England. Having arrived last Sunday, she is already working with us. But, you may be wondering: ‘What’s the reason behind her visit?’ In eHidra, we work on different types of projects: web development, marketing… Some months ago, we were entrusted a new project which consists in setting up and managing the Spanish version of Clear Books , an online accounting software already set up in the United Kingdom and Holland. Therefore, we aren’t only learning about accounting, but especially about this software. We can’t think of a better way to do this than having Suzy’s support since she can show us the ins and outs of this tool and how to work side by side both the international and the Spanish Clear Books teams. In eHidra, we are pleased not to have borders when it comes to projects and professional relationships. It’s a pleasure for us to be part of such an important international project as it is Clear Books Spain, especially when having the support of professionals like Suzy. She will share and help us in this adventure. We will try to learn as many things as possible from her. But also, we hope that she will learn at least a little bit from eHidra and she will enjoy the days she will spend with us.